for the girls to show you. I refused to buy one. "Oh, I'd love to make one up." and then what was I going to put it all in??? her kit was quite doable. Kind of changed my kit thoughts. And I didn't have to make a needlecase! they fit in with the pins. maybe they'll stay with the kit. I made me a little travel one. Love the ground walnut shells for filling. because it's not heavy enough to stay. Not these, they stay put. 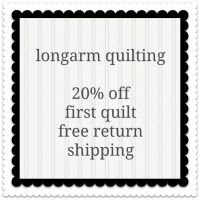 (if you need any let me know). Got the scissors in Mexico. Container is a school pencil box. 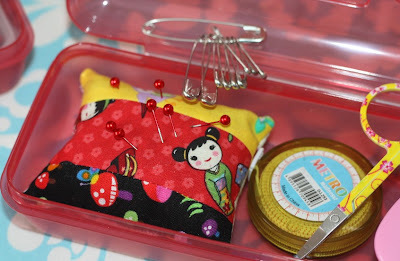 I love this idea and have pinned it so I can make one for my daughter! Using the bobbins is a brilliant. 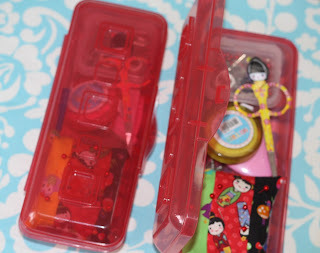 Adorable first aid kit! Just what a young college girl needs:) Don't you just hate it when they move away??? 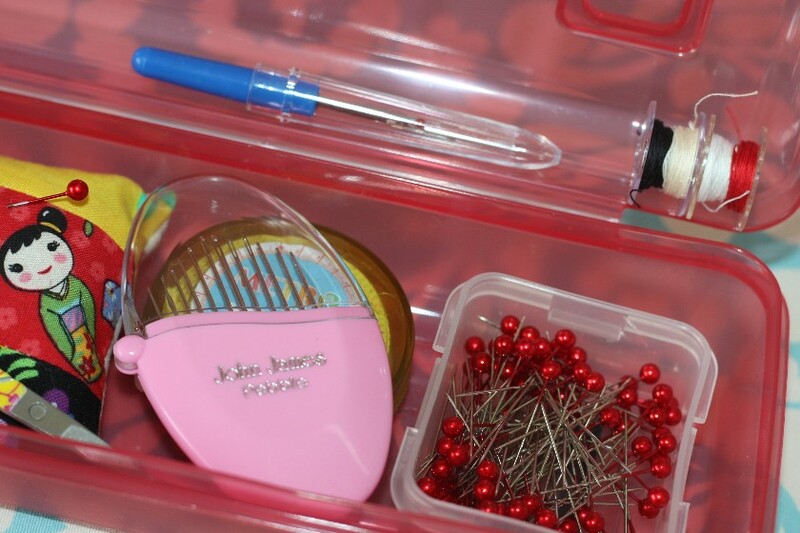 I think she meant sewing kit :), but uh oh...the girls don't have first aid kits either! Now I'll have that on the brain. They can buy a box of band-aids. Yes, children growing up stinks! Could not be cuter. This is the kind of kit my girls would want. They wouldn't really appreciate the kind of kit Lori has a pattern for. That said, my sisters would appreciate it. So we are going to make those this summer. But yeah, this works perfectly. And the scissors are sew darn cuteee. This is so cute and a great idea! 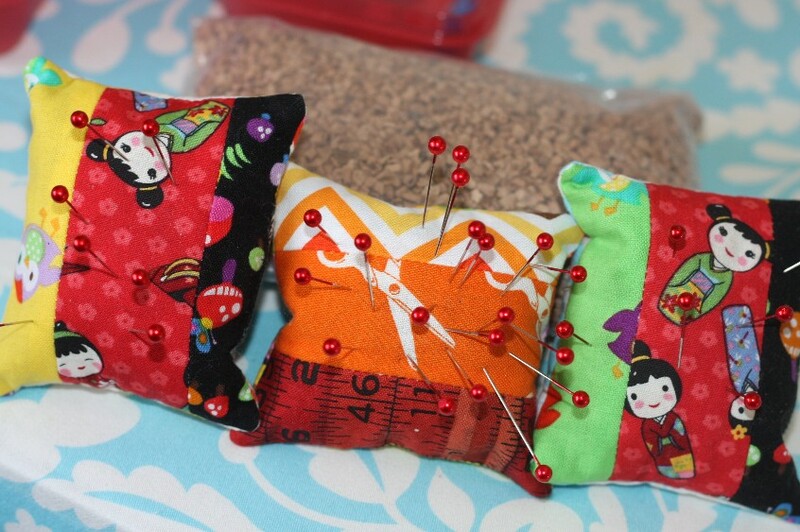 I need to make some of those pincushions (thankfully they do not require the use of a glue gun.) Thanks for sharing! Very cute. 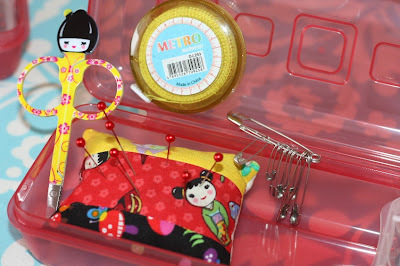 I need a kit to put with my hand sewing stuff when I am out of town. It`s very nice and wondoerful idea!! 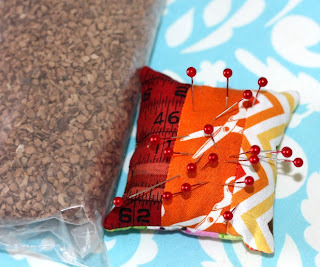 Mending with a stapler. Hmmm. Sounds intriguing. Your kits are AWESOME and you sort of notched it down for those of us who are over-achieving sewing maniacs who think we have to be pioneer women and make everything from scratch. I have THREE of those plastic pencil boxes for my own sewing kits in my sewing studio and I stole one of those from my college daughter years ago. Works for me. Loved this post! Those turned out so adorable!!!! I love them and your girls will treasure them. Gorgeous sewing box, such a great idea. Although - talking of staplers as mending tools, I have used sticky tape, staples and sticky putty (I think that is the right term, in Australia we call it Blu-Tak). I recommend the staples over everything else. Sticky tape tend to peel off at the most inopportune times, Blu-Tak works until the item gets washed, then it stops sticking but remains on the fabric in a big mess! So from someone who used these methods as a teenager - GO THE STAPLER!!! This is such a cute idea! I love it!!! 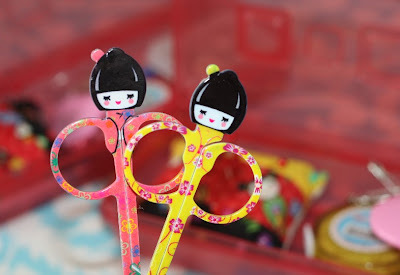 And the little scissors~just perfect. Too, too cute! 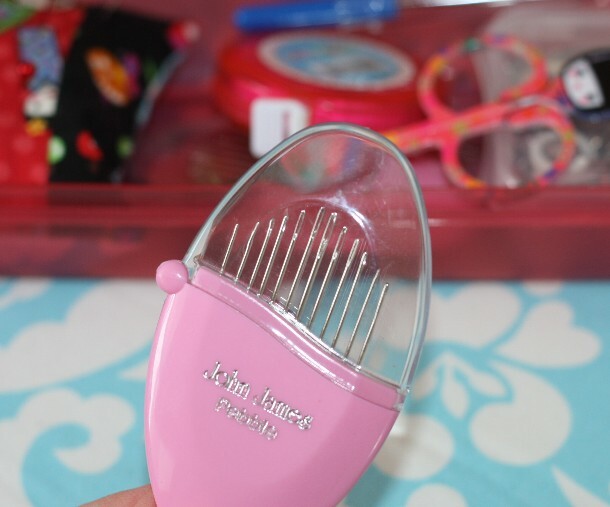 I love the scissors too! I remember Mom mending her pants with a stapler! Miss Bella comes by it natually!! I love the little pencil box shape. perfect! Adorable gift! 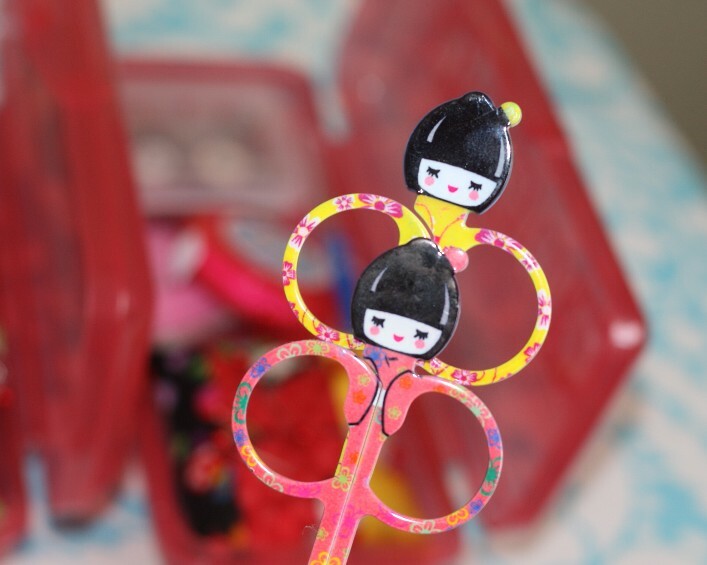 I love those scissors. This would be useful to so many people even if they have those items, to have them in a totable container all together is great! Oh - how you make me laugh, Miss Corrie! 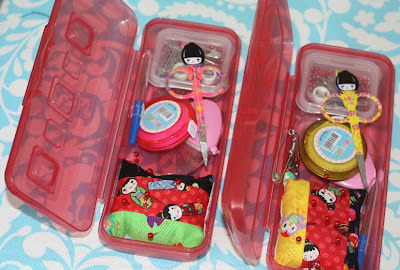 I'm SO going to start on a itty bitty sewing kit for my daughter(s). Thanks for the ideas. I'm coming shopping in your shop! Such a perfect, simple idea! I'm thinking those would make great little Christmas gifts for the college kids in our famiy -- thanks for the super idea!